At Wadav, we really hope that you love the products we recommend! Wadav may collect a share of sales from the links on this page. Instant cameras are beautiful. They trigger nostalgic memories. Generations of people knew the Polaroid camera until 2007 when it started disappearing from the shelves of the shops thus, disappeared from our lives. Until then, it was just a cult, especially in the 70s and 80s. The principle was simple: you pressed the trigger and the photo was directly generated and printed out. That was truly an All-in-one device and without the need for an additional printer. There was no image preview. The photo of the instant camera was like a surprise egg and often the reason for funny anecdotes. The instant camera has always had its special charm and it has not lost even for today. In addition, there are situations where you would like to hold the photo immediately in your hands. 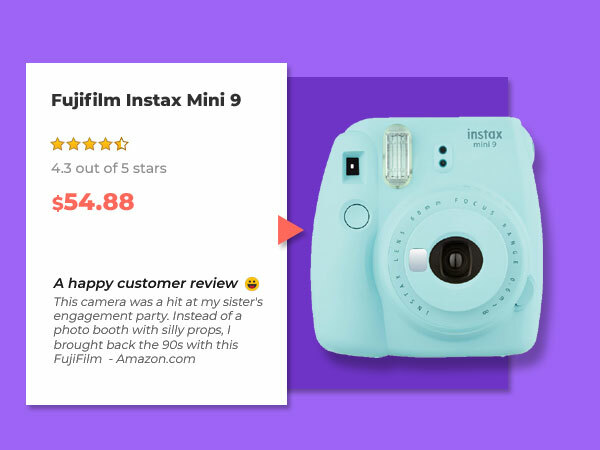 The Fujifilm Instax Mini 9 comes with all the great features of the Instax Mini 8 instant camera. In addition, new features have been added which will give you an improved performance. The camera is currently available in five new colors: cobalt blue, lime green, flamingo pink, ice blue and smoke white. The stylish and compact look is based on the tried-and-tested design of the Instax series. Like its predecessor, the Instax Mini 9 offers great portrait and self-portraits. For selfie lovers, Fujifilm added a mirror next to the lens. A close-up lens adapter allows you to capture images from a distance of 35 - 50 cm from the lens. Discover your creativity with the additional option of macro photography. The possibility of macro photography is perfect for photographing insects and other small wild animals. You can create exciting photos if you would like to combine macro exposure with a double exposure. Are you struggling to find the right lighting? The Instax Mini 9 automatically scans the surroundings for their lighting conditions. After the optimal brightness setting, the corresponding lamp will light up immediately. All you have to do is turn on the brightness slider on the illuminated display to get the perfect lighting for your surroundings. Of course, the different modes can also be set manually. Here you have the choice between indoor and outdoor shots. When taking pictures outdoors you can choose between "cloudy", "bright" and "very bright". Our conclusion on Fujifilm's latest hit is quite positive. The differences to the Instax Mini 8 are smaller than expected, but the Instax 9 is better. Externally, there are not many changes. 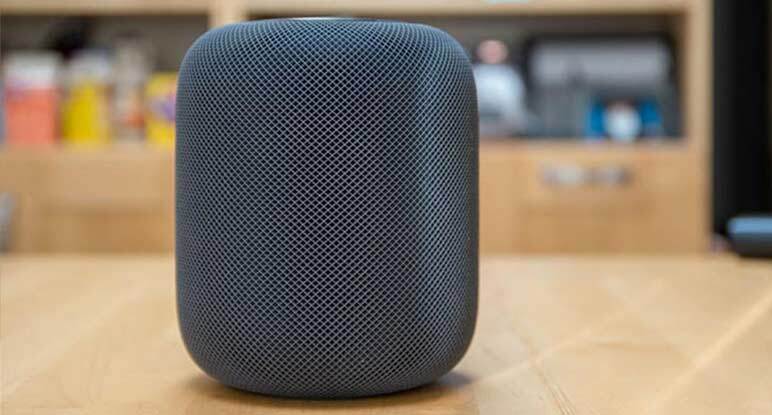 The shape is the same as in the previous model. This, in turn, is extremely handy when it comes to matching accessories. Technically, Fujifilm has upgraded the high-key mode, as well as the option of macro recording. This creates new creative design possibilities with the camera. Fujifilm has equipped the Instax Mini 90 Neo with a 60 mm lens. In addition, the instant camera has a macro mode with an f22 aperture, which can be used in a range of about 30 to 60 cm. The company itself recommended an optimal distance of 40 to 60 cm. The camera was able to score in macro mode with acceptable photos. Other modes are Party Mode, Child Mode, Landscape Mode, Double Exposure, and Long Exposure. The different modes can be selected by turning the lens. This results in a very pleasant workflow. This is a very thoughtful and efficient concept. If you want to take pictures at parties (in darker rooms) the party mode of the Instax Mini 90 is ideal. The flash intensity adapts to the lighting conditions of the room. With the double exposure, you have the opportunity to put two shots on top of each other. This can create very creative and artistic effects. 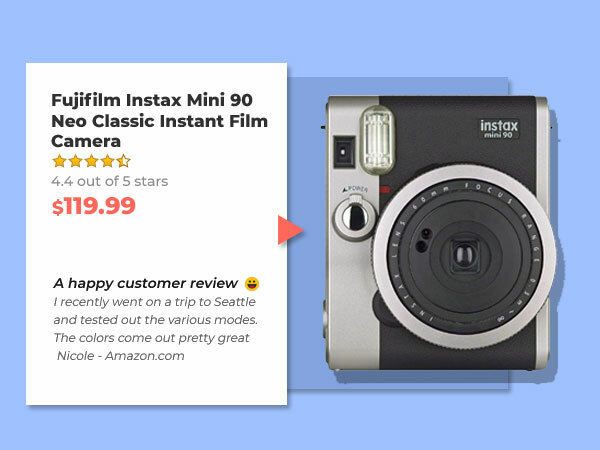 Fujifilm and third-party manufacturers offer a lot of accessories and enhancements for the Instax Mini 90 Neo Classic like bags, straps, color filters, and many other interesting gadgets. The camera body itself is made of plastic, but the leather significantly enhances the look and leaves a solid impression. The thoroughly thought-out design of the Instax Mini 90 Neo Classic has completely convinced us. We definitely recommend this camera. There is no denying that the new Leica camera is quite a pretty Polaroid camera. But what exactly does the instant camera do and can it be captured with the Fujifilm Instax Mini 9 Neo? While many models from Fujifilm, Polaroid and Lomography look rather playful, Leica relies on an "adult" design. Sofort is available in three different colors; Orange, Mint, and White. Although the case is made of plastic, it still makes a solid impression. Like the Instax Mini 90, Leica offers several modes to choose from. Your magic moments are captured even more impressive on Polaroid. The modes can be easily changed by pressing a button on the back and are shown on the display. Here you will find, among other things, a brightness correction, which you can do by clicking on the sun symbol. This will make the photo a bit brighter. Of course, the automatic flash function should not be missing at Leica, also manually can regulate the flash. 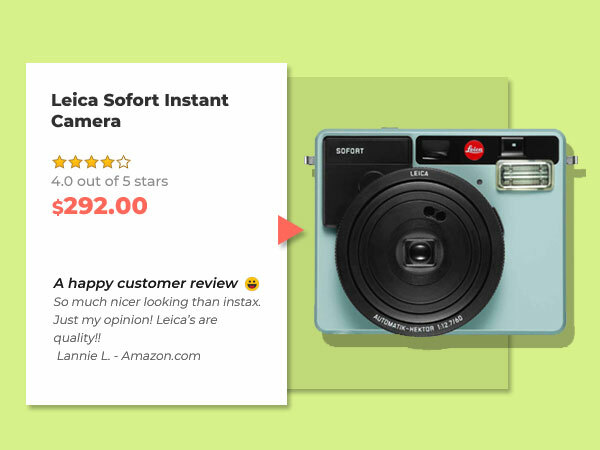 Leica Sofort is a pretty, but also an expensive instant camera. It offers interesting modes for realizing creative ideas and is great fun. 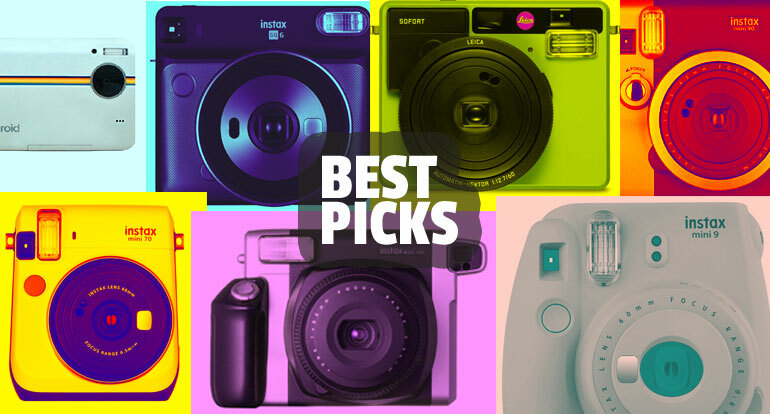 Due to the external "mature" design is quite one or the other undecided addressed that the popular Polaroid cameras are too squeaky and colorful. The Instax Mini 70 was equipped with a 60 mm lens, which corresponds to the usual Instax installed on the Instax series. The macro mode works with an f22 aperture and is applied at a distance of 30 to 60 cm. At a shutter speed of 1/2 - 1/400 second, the camera is switched electronically and allows great snapshots. An existing tripod socket on the bottom of the camera allows you to upgrade the Instax Mini with a tripod. In addition, the camera has various modes that offer interesting design options like, the ever-popular selfie, macro, hi-key and landscape mode as well as the self-timer. There’s also an automatic exposure control. 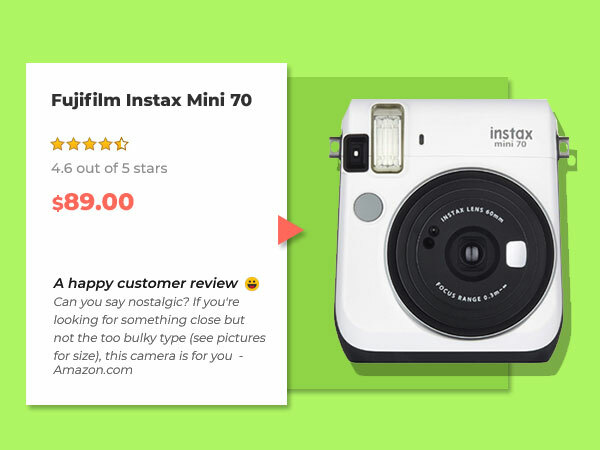 The Instax Mini 70 from Fujifilm is one of the newer instant cameras and offers great features for relatively little money. 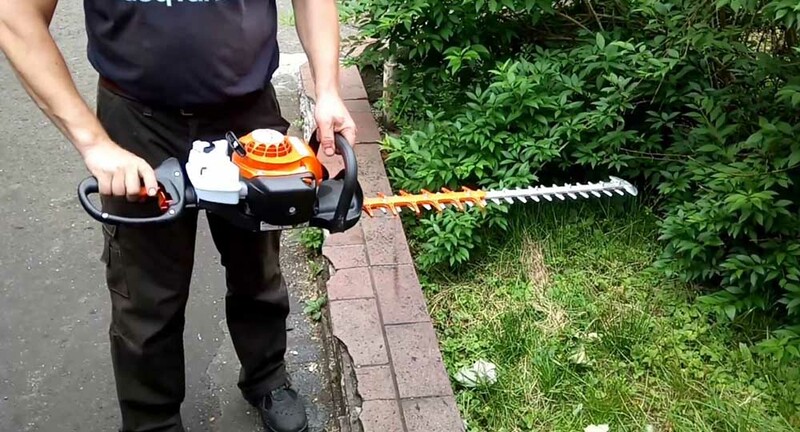 It is extremely handy and feels good in the hand. The trigger is the only thing we didn’t find great. Unlike the Fujifilm Instax Mini 8, the Z2300 is a digital instant camera. With the help of the integrated display, the Z2300 has the possibility to view the Polaroid images before printing. This saves costs compared to an analog instant camera. This is where the zinc ink technology from Polaroid comes in. The Polaroid Z2300 not only makes great pictures but is also able to provide usable sound and video recordings. 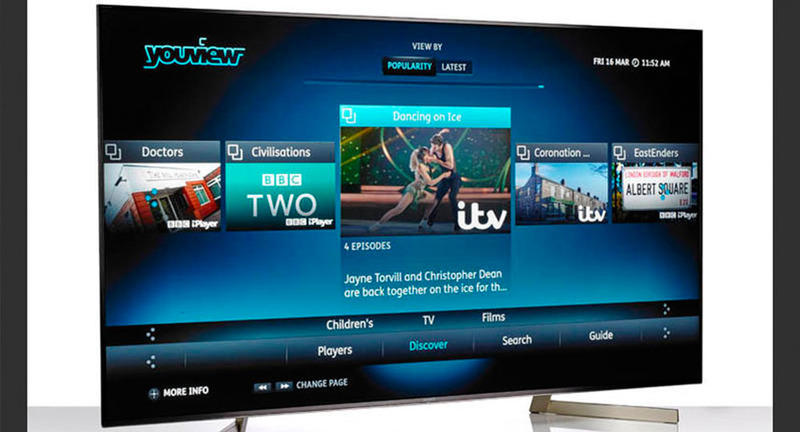 The HD video recording takes place with 720 pixels with up to 30fps. The integrated display enables on-site playback, but it is much more fun on the computer. This camera comes with its own zinc ink technology, which works completely without ink. To make this possible, Polaroid uses a special zinc photo paper. In addition, the Polaroid Z2300 has a self-timer. Unfortunately, the zoom function is a just 6x digital zoom. An optical zoom would be desirable for future models. SD card slot, display, video recording and the relatively low price for the photos are the power points of this camera. 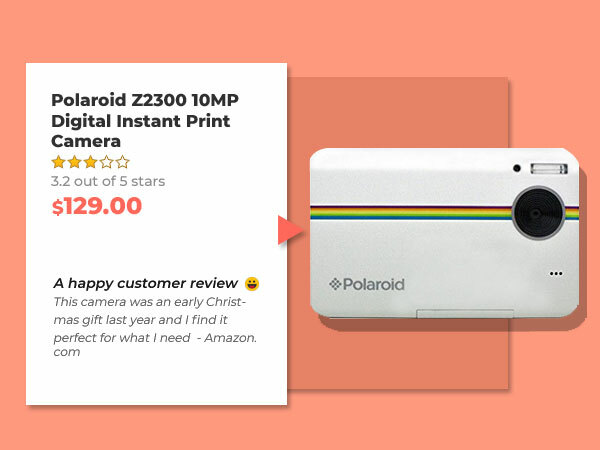 The Polaroid Z2300 is not one of the cheapest Polaroid cameras. However, if you want to buy a digital instant camera, you can’t be deterred by the purchase price. 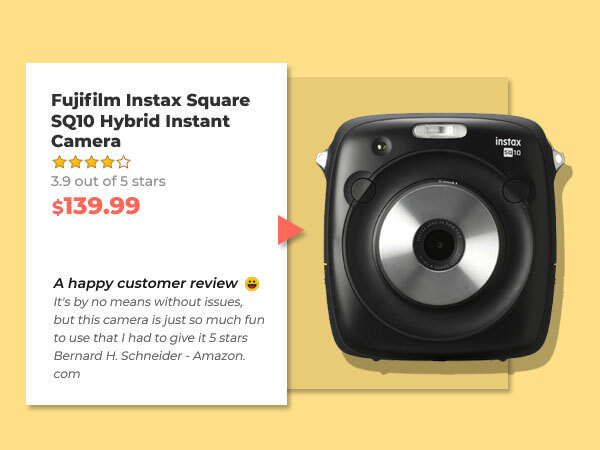 With this price tag, you get an instant camera with the positive features of a digital camera. Unlike the Fujifilm Instax Mini 8 and Instax Mini Film, the Instax Wide Film is twice as large at 62mm x 99mm. For comparison, the Instax Mini 8 comes with a picture format of 62mm x 46mm. Thus the Instax Wide is perfect for panoramic pictures on vacation, or group portraits. The new design is probably based on the Instax Mini 90 Neo Classic. The integrated tripod thread makes it possible to equip the Instax Wide 300 with a tripod. Other optional accessories include various camera bags, albums, attachments with color filters and sets. Due to the good and robust processing, the weight is relatively heavier. Nevertheless, the Instax Wide 300 instant camera is very good in the hand. Due to the wide format, the Instax Wide is definitely worth a look for Polaroid camera fans. Instax Square's new file format is slightly larger than the usual Instax films but slightly smaller than the Fujifilm Instax Wide 300. The square format of the photos gives your snapshots a special touch. The advent of digital technology in analog photography has its advantages. 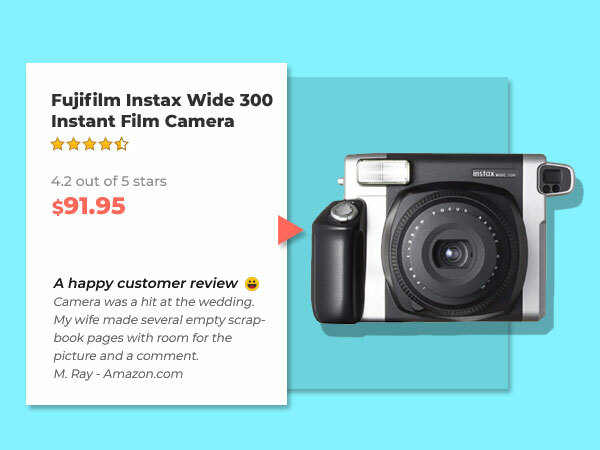 On the one hand, you save on film costs, because of less waste with your snapshots. On the other hand, you can now photograph your subject from all perspectives and with different modes, without wasting the valuable film. If you do not like the result, you can edit it directly on the camera, or simply delete it. With the Instax SQ10, you have ten artistic in-camera filters available. Although Instax Square has a color-film format, black-and-white shots are possible. In addition, there are also in-camera filters to adjust colors, add a vignette or create a collage. Likewise, a brightness balance is integrated. The Square SQ10 is a square camera made in black with silver accents. This is a new kind of camera. It blurs the boundaries between the popular instant movie series and digital cameras. It has many modes and the ability to view and edit images before printing make this model extremely interesting for photography on the go. The battery itself can stand in about 160 snapshots before it has to be recharged. The camera itself acts very fast when switching on, focusing and photographing. Instax is part of Fujifilm's successful instant camera series. This is extremely popular with lovers of lo-fi and instant photography. 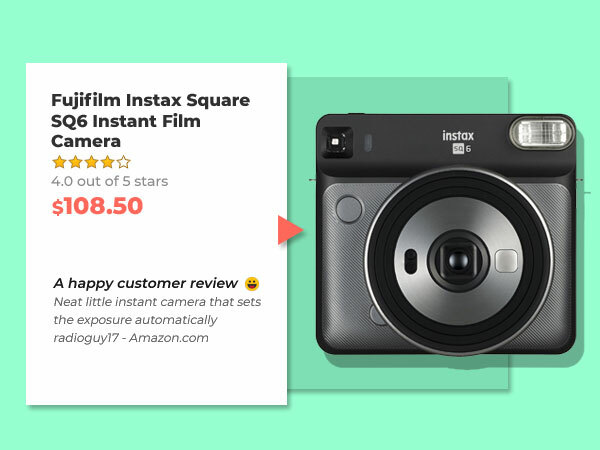 Since June 2018, there is now another model on the market, the Instax Square SQ6. It expands the SQ family and is the first Instax analog camera with the larger Instax Square film format. Previously, this format was only available on Instax printers and digital cameras such as the SP-3 or the Instax SQ10. Although the Instax SQ 6 is an analogue camera, it offers six different modes that will make your photography enjoyable. In standard mode, the camera is set for subjects at a distance of about 2 meters. Likewise, the flash is automatically activated and must be deactivated again when switching on the camera if necessary, because the camera has no memory function. The feel of the SQ 6 instant camera is very good and it fits well in the hand. But unlike other Polaroid cameras, the viewfinder is on the right side. The camera measures 118.7 x 128.1 x 58.1 mm (W x H x D) and weighs 393 grams (excluding battery, strap and film pack). The Instax SQ 6 is a successful development of the Instax series. Unlike older models, the lens automatically extends and provides a light sensor. In addition, the six modes make the creative photographer's heart beat faster. This is especially great if you’re shooting the pictures in square format.